Italy’s heartland or ‘Green Heart’, Umbria has an unrivalled beauty in this beloved country. Its lush landscapes are a pristine patchwork of woodland, olive groves and wildflowers, punctuated by refreshing springs and medieval hill-towns that are steeped in tradition and works of art. For lovers of Italian food, wine and culture, our new cycling holidays in Umbria are a must. 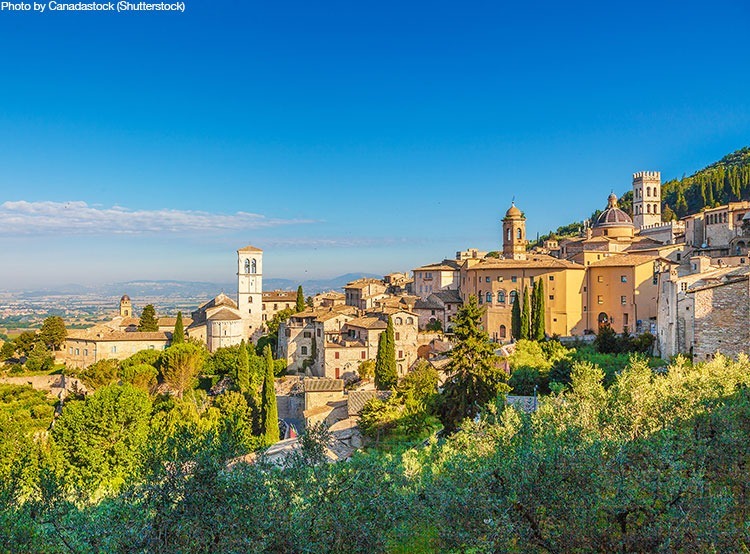 Cycle from one medieval treasure to the next along the Valle Umbra, visiting the World Heritage Site of Assisi and marvel over Giotto’s art in the Basilica of San Francesco. Sounds good so far? This gentle trip leaves you with ample time to explore each stunning town and treat the taste buds in the process. Our brand new family cycling holiday offers the best of both worlds on and off the bike. Our routes are gently undulating and mostly traffic-free through the Valle Umbra’s gorgeous green and mountainous landscape, stopping at the hilltop towns along the way for gelattos galore. Accommodation has been carefully selected and we’ve even included a pizza making evening! Looking for more Italian gems to push the pedals? Explore all the incredible corners of Italy by bike with us in 2018. Take a peek at our amazing range of tours here.